In 2003, ALPS Group® Development (ALPS) worked with JFNew, an ecological service firm to identify high quality natural features on an old farm with an eight-acre lake filled with debris. ALPS Group® then planned the Tuscan Hills subdivision to protect and restore these resources. Sixty-eight small residential lots back up to common areas with restored prairie, ponds and woodlands. A hiking path runs through the natural areas. Single family homes range from 2,700 to 3,200 square feet. ALPS Group® preserved open space in common areas through recorded deed restrictions and marked them as protected on the final plat. Although the developer did not extend a conservation easement over natural features, it worked with The Conservation Foundation (TCF) to create protective covenants. The covenants establish the Homeowner’s Association’s (HOA) obligation to permanently maintain common areas, which include natural areas throughout the development. 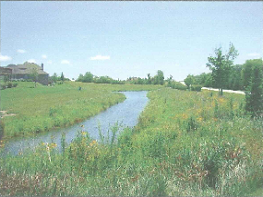 The HOA must collect assessments to support the site’s natural hydrology and follow the approved management plan. The covenants create an Architectural Review Board (ARB) to ensure landscape and layout plans preserve existing trees when possible and promote natural hydrology and stormwater management practices (such as rain gardens and native plantings). Residents cannot remove trees without approval from the ARB. The covenants restrict how residents can use or impact natural areas. Residents cannot disrupt stormwater management or water quality functions or build docks. Aside from prescribed burns or other permitted uses, people cannot have bonfires or burn refuse anywhere in the development. Residents must pay for any damage to natural areas and cannot cause any erosion. The covenants require the HOA to fully fund a qualified maintenance provider to manage its natural areas and describes necessary qualifications for such companies. Maintenance providers (land management companies) must have at least five years.